NOTE: Some of the sections below are hyperlinked and available on this website, enjoy! 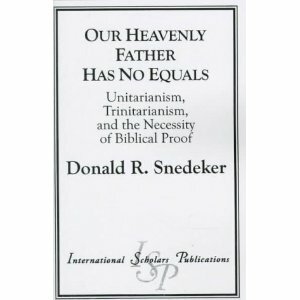 Drawing on a variety of sources for historic Unitarianism (Rees, Morgridge, Dana, Farley), Snedeker’s study stresses the importance of reason in theological inquiry. The author conflates the various arguments of trinitarianism, then refutes them according to reasonable standards of biblical interpretation and staying within the framework of common sense. Various Trinitarian arguments are stated, explanations are given as to why they are not reasonable enough to overthrow the many verses in which the Father is represented as God. Jesus Christ is exalted according to the Unitarian view of God, as Jesus is positionally second over all of God’s creation. A compelling contribution to the Unitarian-Trinitarian debate.